Hundreds of JMT Punch Presses all around the world attest to the quality, reliability, and stability of our machines ; their stress relieved steel construction, modern design, state of art control system, software suite, and quality proven hydraulics are the distinctive characteristics that set out machinery apart in the world. Auto-clamping, strong and flexible turret structures, simple and perfectly designed standardized & supplementary equipment set the standard of what to seek in the industry. The user friendly CAD/CAM software rounds out our machines to offer perfect full packages to our clients. Possible software and parameter problems can be checked via “Remote diagnostic” function of our control unit. JMT Turret Punch Presses are designed and built for a long lifetime. 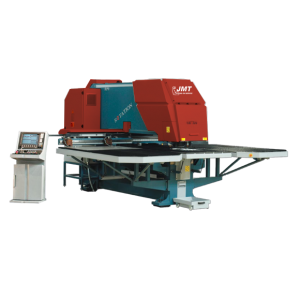 Stress relieved construction and high-quality hydraulics, plus state-of-the-art control system and software, make these machines perfect for your metal punching needs. We can also integrate loading and unloading systems for a complete workflow solution. Talk to one of our experienced salesman today about your production needs. JMT Turret Punch Presses are available in different sizes.